Luna is expertly crafted to shine brightly on any type of desktop, tablet, or mobile device. 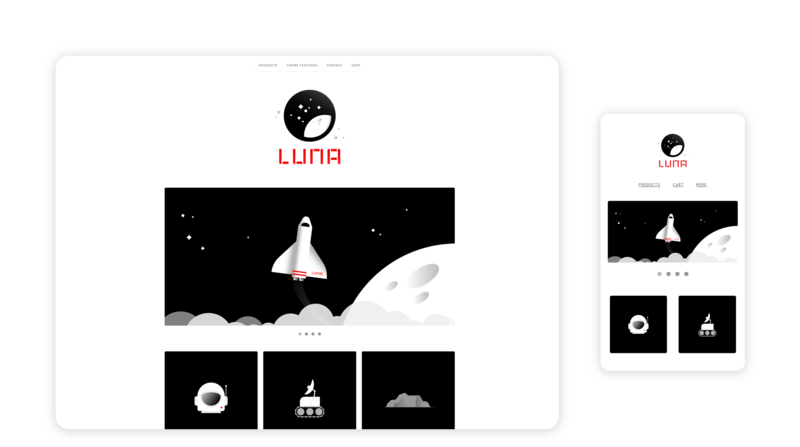 🌕 We love Luna so much that we gave it a complete refresh in 2019! NEW MOON ALERT! 🌚If you installed Luna in your shop before January 24, 2019, you’re using an older version of the theme that doesn’t have all of the sleek new features and improved mobile version. Read more on what’s changed in our blog post here. To update, you’ll be re-applying the Luna default theme, so it’s important to back up any custom changes you want to keep and add back in later. Once you hit Save, you can’t get the old version back, so be sure you’re ready! Head to Customize design > Customize in your admin. Save your header, slideshow and background image files if you don’t already have them on your computer (right-click or Ctrl+click > Save Image). If you love your current color scheme, jot down the hex values (color codes) for each element. Make a note of any font selections you’d like to keep. If you’ve customized your theme’s HTML or CSS code, you’ll want to be sure to back up your current theme. Now you’re ready for the update! Click Themes in the top left corner and choose Luna. Go back to the Customize tab to add your images back, update your fonts and color scheme, paste any of your custom code back in, and tweak any new settings. Hit Save when you’re finished.